At Google I/O 2018, the big announcement for Chromebooks was Linux app support. Even though it only works on the Pixelbook right now, with support for more models coming soon, it's still very exciting. That isn't the only new feature coming to Chrome OS - several other changes were covered after the keynote or discovered in recent Chromium commits. One of the last remaining issues with Android apps on Chrome OS was the lack of SD card support. Despite many Chromebooks having microSD card slots, Android applications could only see the internal storage. At long last, this is finally changing. 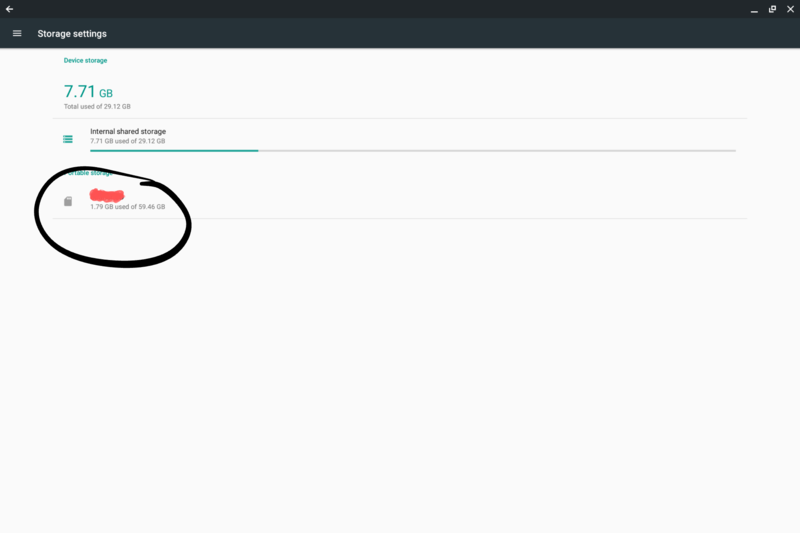 One user on Reddit shared the above screenshot, showing an SD card in the Android storage settings. Access seems to be read-only for now, and you can't format it as internal. Still, just being able to view SD files at all from Android apps is a welcome improvement. The screenshot was taken on Chrome OS Beta 67, so it might roll out to stable soon. 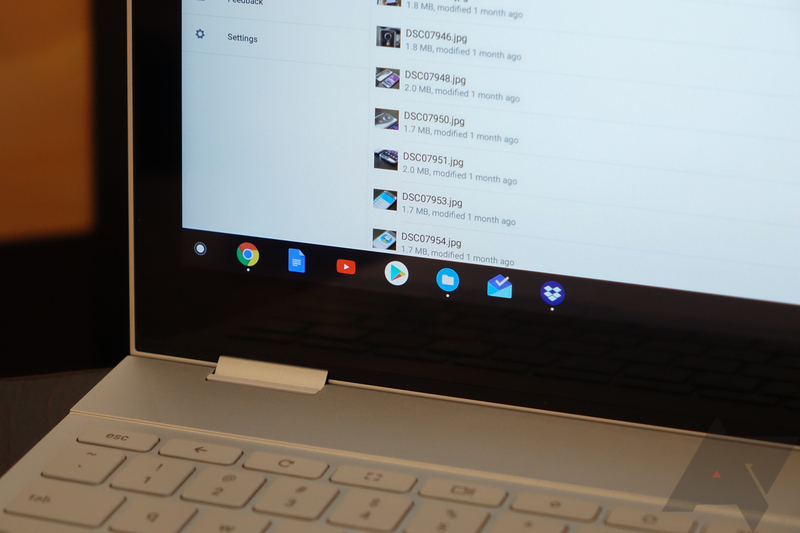 Google confirmed at I/O that drag-and-drop for files will soon work between Chrome OS and Android apps. For example, you'll be able to drag an image from a Chrome window to a file manager on Android. Chrome Story discovered a code review on the Chromium Gerrit related to future snooze notification support on Chrome OS. This was added to Android with 8.0 Oreo. Google has started testing a Picture-in-Picture mode for Chrome OS. This doesn't add support for PiP from Android apps - instead, you can pop out videos from Chrome into a separate window. You can see a demo of it below. Opera, Samsung Internet, and Safari already have a similar feature, so it makes sense that it would eventually come to Chrome. This is currently being tested as a flag on Chrome Dev/Canary 68. Google confirmed that Gboard will come to Chrome OS, with the developers hoping to have it ready by version 69 (due in September of this year). It should have all the features of Gboard on Android, including GIF input and emoji search. There are a few Chromebooks that come with a stylus, like the Google Pixelbook and Samsung Chromebook Plus/Pro. Drawing latency isn't the best on Chromebooks, but Google wants to change that. The company is adding a new 'Ink Overlay' API for apps to implement lower-latency drawing, hopefully dropping response time from 100ms to nearly zero, using a combination of machine learning prediction and software tweaks. 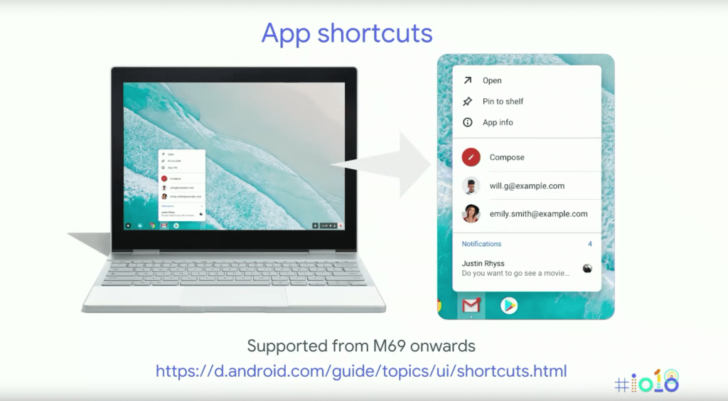 Earlier this month, it was revealed that Google was working on Android app shortcut support for Chrome OS. That has now been confirmed, and just like with Gboard, it is expected to arrive in Chrome OS 69. App shortcuts will appear in the app drawer, as well as the Chrome OS shelf. You'll even be able to pin specific shortcuts to the shelf, much like adding them to the home screen on Chrome OS. While not part of Chrome OS itself, you can now set up a Chromebook emulator from Android Studio, so developers can test apps without buying a physical device. Chrome OS is improving at an incredibly rapid speed, and it's exciting to see the platform's last remaining issues be addressed. Now where is Assistant for all Chromebooks, Google?